Thank you for signing up for your FREE report. 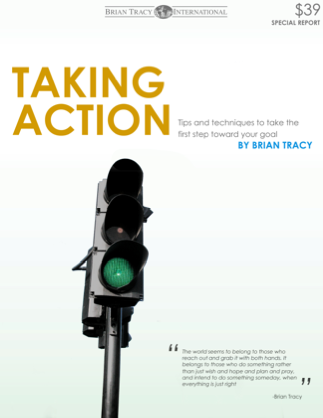 Check your email to download your copy of Taking Action! Revealed – a proven, step-by-step process for taking action and moving forward toward ANY goal. But let’s face it – “waiting it out” has dangerous consequences: how long will you wait? When will you take action? What if things NEVER look up (like what some of the talking heads on TV and the radio say)? The time to take action toward the life you want is NOW. If you’re feeling stuck, it’s not your fault. All that doom and gloom we’re fed every day really puts a damper on things. It can be scary to take a step in any direction – what if you’re headed the wrong way? What if you make a bad choice? Did you know that 99 percent of the time an airplane leaves Chicago for Los Angeles, it’s off course? The pilot must make continuous adjustments to get that plane to Los Angeles. But if the pilot never took off from Chicago, he’d never get the plane to L.A. The same goes for you: everything you do is filled with uncertainty. But if you never take action, you never get anywhere. My brand new special report, “Taking Action,” details precisely how you can begin to move toward your goals – no matter what they are, or what size. I’m Brian Tracy, owner of Brian Tracy International, and best-selling author of more than 50 books and 300 educational programs. Yes, I’m successful. But my path to success has been anything but linear. At one point I lived out of my car – and worked hard, manual labor. In other words, I started on a course, made adjustments as I went, and achieved extraordinary success. Once you set your mind to it, success is inevitable. But you must take the first step, no matter what that is. As I mentioned before, almost every time a plane takes off from one location and heads to another, it’s off course. The pilot makes continual adjustments throughout the journey – but always ends up at the right destination. What matters more than anything is taking action. If you’ve ever read my materials or heard my talks, you know I always overdeliver. I pride myself on providing you with information you can use immediately to improve your life. So I encourage you to take action NOW and download this special report!